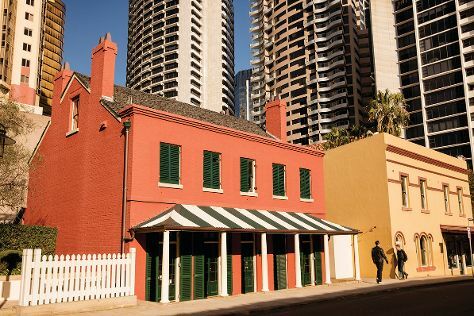 Satisfy your inner culture vulture at Australian National Maritime Museum and Darling Harbour. Art Gallery of New South Wales and Hyde Park Barracks Museum will appeal to museum buffs. Take a break from Sydney with a short trip to Norman Lindsay Gallery & Museum in Faulconbridge, about 1h 20 min away. Spend the 20th (Mon) exploring nature at Sydney Harbour National Park. Next up on the itinerary: appreciate the extensive heritage of The Rocks, admire the masterpieces at White Rabbit Gallery, contemplate the long history of Justice & Police Museum, and see a show at Sydney Opera House. To find more things to do, other places to visit, maps, and more tourist information, you can read our Sydney online trip itinerary maker . May in Sydney sees daily highs of 24°C and lows of 14°C at night. Finish your sightseeing early on the 20th (Mon) to allow enough time to travel back home.